Should Confiscated Ivory Be Destroyed or Used as Artistic Statement? Artists are used to controversy. For some, that is the main reason they became artists–to bring attention to a cause or some unfairness. Many wildlife artists also want to raise public awareness to the plight of their favorite animals. Public policy is to destroy ivory–it is too difficult to know what has legitimately been found, what is truly old art, and what is a result of poaching. Read how Botswana has done something that many officials would not dare to do–unveil a sculpture made from ivory tusks. A towering elephant sculpture made entirely from ivory tusks will now greet arrivals at Gaborone’s international airport, in Botswana––a poignant symbol of the country’s commitment to protecting wild elephants. 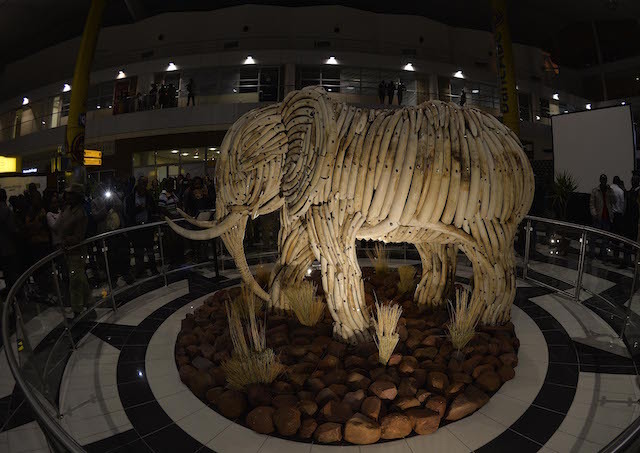 The 2.5-ton sculpture, constructed from the tusks of animals that died of natural causes, was unveiled today by the president of Botswana, Ian Khama, at Sir Seretse Khama International Airport. The most recent estimate of elephant numbers in Africa, from 2007, is between 472,000 and 600,000. Around a third of them are within the borders of Botswana. Poaching rates of elephants have surged during the past three years, fueled by rising demand for illegal ivory in Asia, mostly China. A 2014 study revealed that between 2010 and 2012, up to 100,000 elephants were slaughtered for their ivory. The placement of the elephant sculpture at Botswana’s capital city airport is symbolic, as it represents the international dimension of the illegal ivory trade, president Khama said. A team of six artists took 3 months to create this sculpture. Thanks to Paul Steyn and National Geographic for this eye-opening and thought provoking information.